Remember when Pluto was nothing more than a pixelated blob at the edge of our Solar System? We were so young then. But now, seven months after New Horizons’ historic flyby, scientists have amassed so much data on the former ninth planet that they’re constructing our first geologic maps of it. The map above spans a 1,290 mile-long section of Pluto’s surface and includes some of the most interesting and dynamic features this frozen wonderland has to offer. At the centre is a portion of Sputnik Planum, blocky plains of nitrogen ice with hills of frozen water floating on top. One of the brightest and most distinctive features on the surface of Pluto, scientists now suspect that Sputnik formed when an asteroid the size of Manhattan crashed headlong into the dwarf planet. Surrounding Sputnik is a complex mess of ridges, valleys, and pits, sculpted by erosion and possibly tectonic processes. The entire region has been imaged at a resolution of 1,050 feet (320 metres) per pixel or better, allowing scientists to pick out geologically distinct areas. The different regions are colour-coded and labelled below. For instance, the purple unit represents the jagged mountain ranges on Sputnik’s western border, while Wright Mons, a possible ice volcano, is shown in red at the bottom. 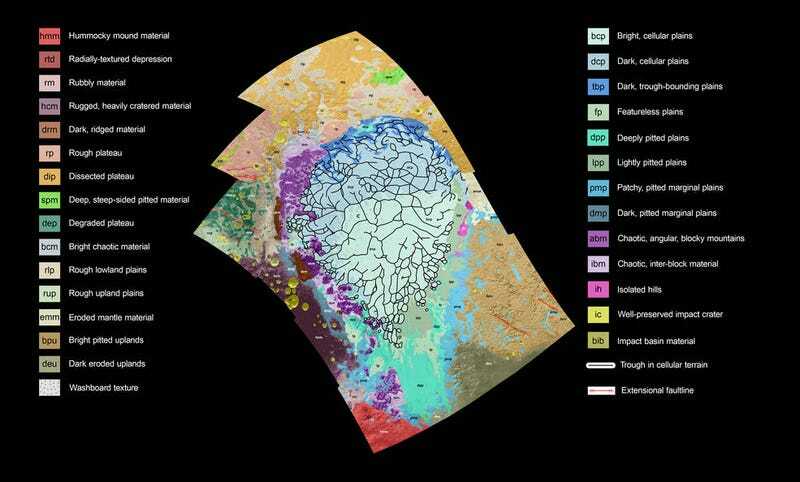 Maps like this are a first step toward understanding the geologic history and evolution of Pluto, a world that’s shaping up to be far more complex and beautiful than anyone could have imagined. But here’s another reason this psychedelic representation should fill you with awe. All of the data that went into this map was collected by a piano-sized space probe as it whizzed 48,000 miles above the surface of Pluto, a planet 3 billion miles from Earth that took nine years to reach at a rip-roaring 30,000 miles per hour. The data was then beamed back to Earth at an agonizingly slow rate of 2,000 bits per second—yes, that’s bits, not kilobits—before being reconstructed and analysed on the ground. If that doesn’t speak to the drive and ingenuity of the New Horizons science team, I don’t know what does.